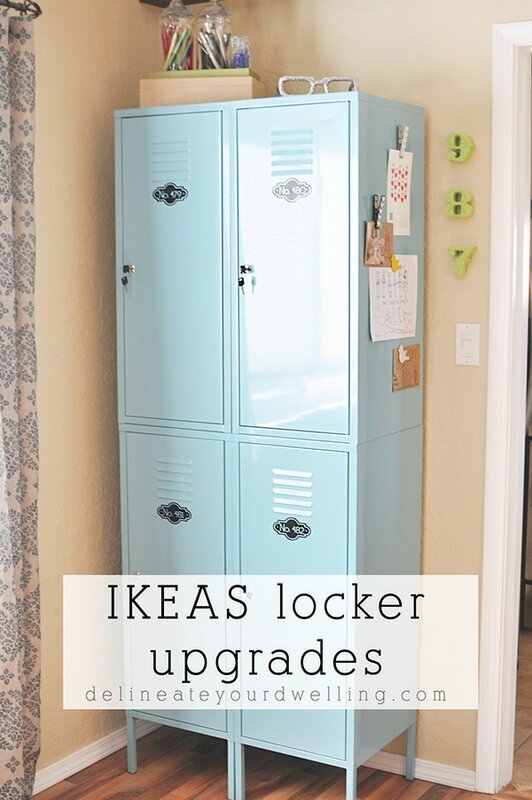 INSIDE : See how to best organize and update your metal IKEA lockers! 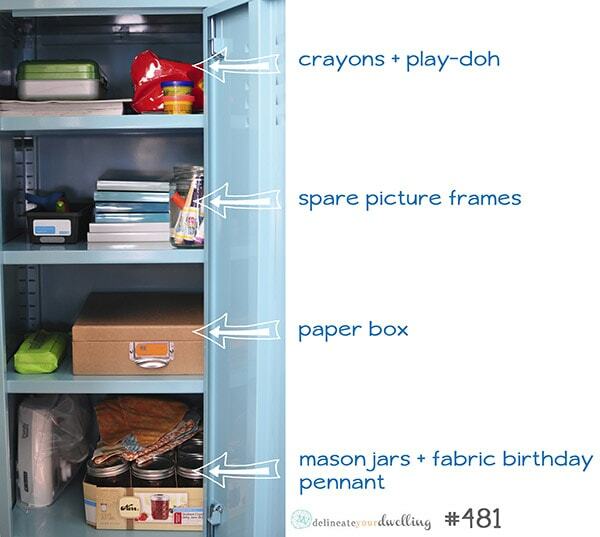 Tips for what to store in your lockers and what containers are best to use. So last month, I shared that I had done a ton of research and finally made the purchase of a pair of blue vertical metal IKEA Lockers. 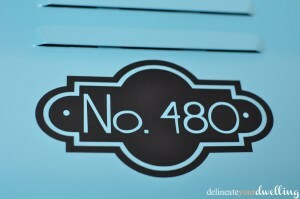 Today I am sharing some more detailed organization of my IKEA lockers. I had long been keeping my eye on these vertical Ikea lockers and although my exact color is not available any longer, I did find some other very similar substitutes – IKEA white, IKEA blue and similar. 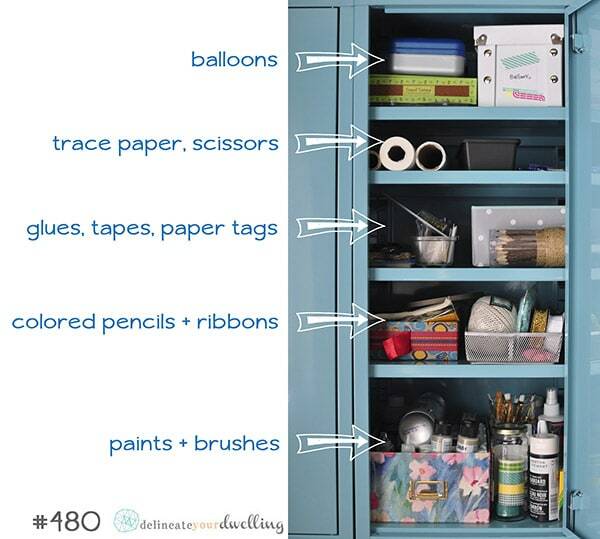 I have spent quite a bit of time sorting through all my craft supplies, purging the items that I no longer need and making a craft organization plan. It is by no means 100% complete but there has been some great progress made. I also added a few decorative items to the top of the lockers because they currently live in our Dining Room. I was surprised how often I would unlock and open the lockers to get out my colored pencils or nice drawing pens. SO, up to the top they went. Now with a quick reach, I’ve got them all right where I need them. I found these adorable metallic glasses at Z.Gallerie a few months ago while “browsing” with my mama. I wanted to display them somewhere down lower but both the kiddos couldn’t keep their hands off them! As previously mentioned, I had a few decal ideas up my sleeves. After taking waaaay too long to figure out how to use my Silhouette printer (birthday present), I came up with these little gems. These four decals took about 3 hours. It was probably because I had bought the wrong sized adhesive vinyl for the Portrait sized printer. Then, I printed all four on one sheet and that ended up being a mess. Then, I misaligned the vinyl and it chopped one of the decals in half. Lets just say, many lessons learned. I think it should have taken an hour to design, print and apply all four. Phew… but aren’t they just lovely? I love those! The color is fabulous and you can ‘t beat the storage. Thanks for sharing at The Makers Amy! I love your lockers! Great use of space. The color is especially nice. Thank you, Stacey. I was pretty excited about the color, too. Thanks, Kayla. I linked up a few of my projects to your party! 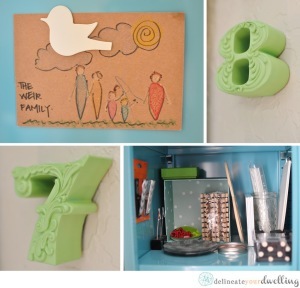 What a creative way to organize and store your things :o) Love this! Thank you so much for linking up to The PINcentive Blog Hop! Happy Friday and I hope you have a wonderful weekend! I love the decals! Makes me really want a Silhouette! 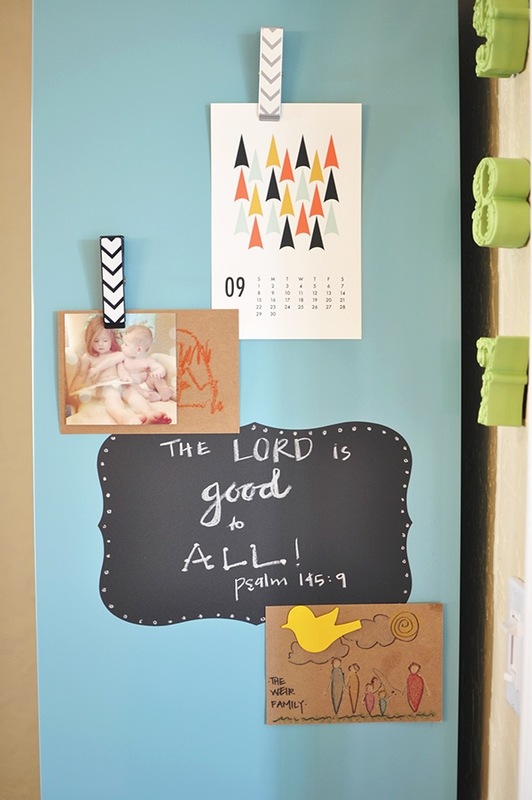 Thanks for sharing that on the Get Inspired Pinning Party! I LOVE these locker decals! They really add the perfect touch to the cute lockers. Thanks for linking up to Frugal Crafty Home Blog Hop! Great ideas! Love the decals. So wish I had a Silhouette of my own, but alas, it’s not quite in the budget. Love my cricut though! Nice job!! 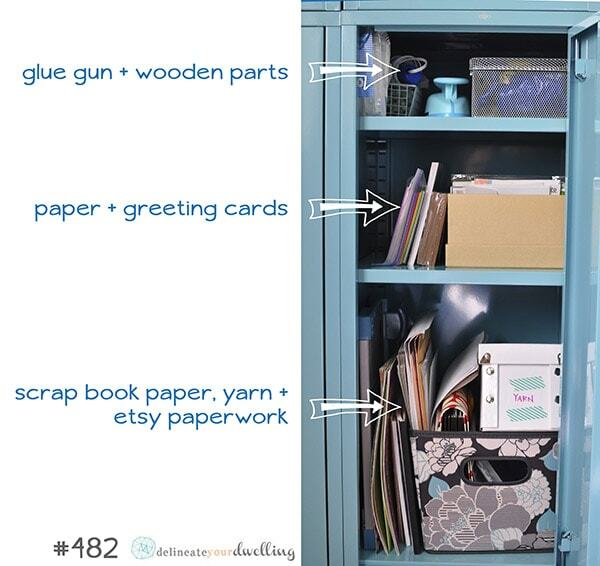 What a great storage idea and so cute! Stopping by from the Frugal Crafty Home blog hop. i love those lockers! unforutnately they’re not in our budget or space in this tiny duplex! but oh they are so cute! I love your lockers! They are so cute! Thanks for linking up with Craft Frenzy Friday! These are sooo fabulous! I love them – such a fun funky look for amazing storage! Thanks for sharing it at Work it Wednesday this week. Pinned!! I absolutely LOVE this! 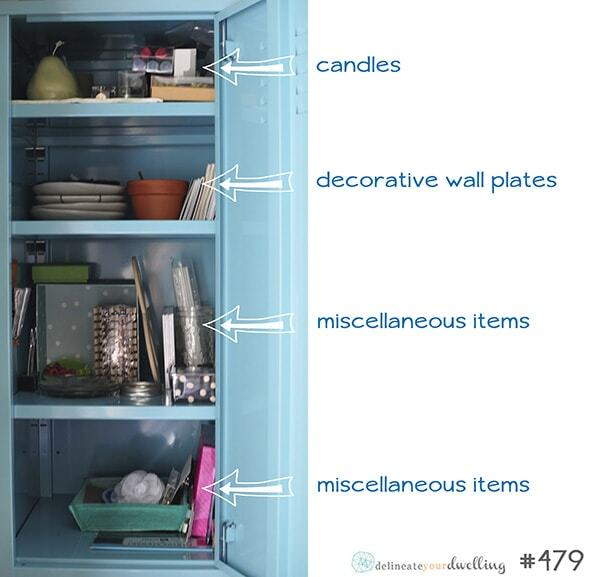 So organized and stylish! Thanks so much for sharing. Have a wonderful weekend. In all my years of vintage shopping, I have learned to NEVER turn down lockers or locker baskets. I am in love with how you arranged yours and the color is divine. Thank you so much, Donna! I literally RAN to Ikea when I saw these for sale. those are awesome, and of course amazing for your supplies.